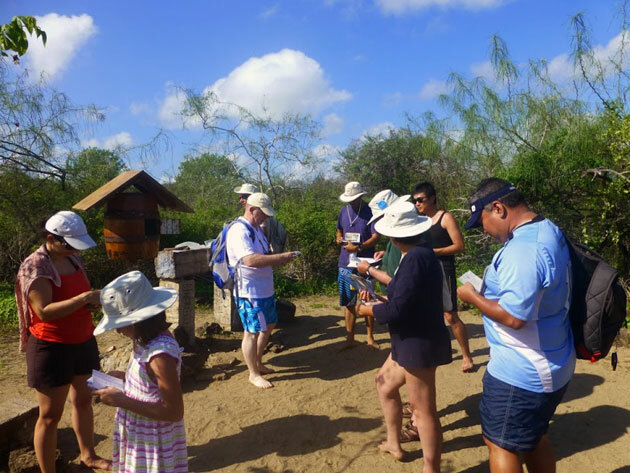 When I arrived at Post Office Bay, which is located on the Galapagos island Floreana, I had my postcard all ready to go. The issue was whether it would go anywhere at all. Without a stamp or an official mail carrier, I had no idea whether my postcard would ever leave the confines of the small wooden barrel I had left it in. If I had been a sailor during the late 1800s, then I may have stopped by Floreana to drop off a letter bound for Europe. Back then a sailor depended on homeward bound ships to deliver mail picked up from the island’s rudimentary wooden barrel post office. I thought the trick to getting my postcard sent, other than it falling into the hands of a tourist who lived near the addressee in New Jersey, was to write something unexpected. Some of the postcards I read left behind by tourists who had arrived before me said things like, “I left this card for you at Post Office Bay. If you receive it someone who also visited Post Office Bay picked it up and delivered it to you. It also means that I was thinking about you.” One postcard contained a love letter addressed to a woman who lived near Niagara Falls. I thought the message was intimate, rather personal. Not a generic, “wish you were here!” – like the others. The sender professed his love, saying, “The times we spent together are the happiest of my life. I only hope that we can carry on…” It was the message that moved me. I held onto that postcard and tucked it away into my backpack. Within a few weeks after returning from Ecuador, my relative showed me the Galapagos postcard I addressed to her. It had evidently caught someone’s eye. The fellow traveler didn’t hand deliver it but rather sent it via regular post. Thanks for the feedback! Galapagos was on our bucket list and is certainly worth a visit.